Villagers Thought They Killed A Supernatural Shape-Shifter. It Was An Endangered Sumatran Tiger. Conservation officials say villagers in North Sumatra, Indonesia, killed a critically endangered Sumatran tiger. 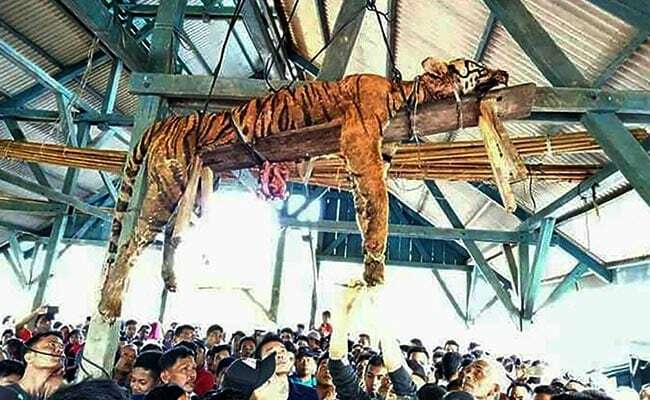 A Sumatran tiger hangs, dead and disemboweled, from a ceiling in a public hall in a remote village in northern Indonesia. A photograph shows the lifeless animal strapped to a wooden plank - and dozens of villagers crowded around to see it. It's not certain exactly why the critically endangered animal was slain Sunday in a village in North Sumatra, Indonesia, but local news reports say it had mauled at least one or two residents who had followed it to its lair - to determine whether it was a mythological, supernatural being. The Jakarta Post reported that superstitious villagers feared it was a "siluman," or shape-shifter, and when rangers would not kill it, they took matters into their own hands and decided to kill it themselves. "The tiger was sleeping under a resident's stilt house when the people struck him repeatedly in the abdomen with a spear," an official from the Batang Natal subdistrict told the newspaper about the slaying. Hotmauli Sianturi, with the Natural Resources Conservation Agency, told Reuters that conservationists urged the residents not to harm it, explaining that a trap had been set to try to catch the big cat. "We explained to the villagers that the tiger is an endangered animal . 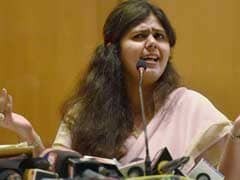 . . but they didn't like our way of handling this situation," she told the news agency. Sianturi told Agence France-Presse that concerned residents "insisted on killing the tiger." "After killing the animal, the locals hung up its body for display. It's very regrettable," she said. The incident occurred only a day after the United Nation's World Wildlife Day. This year's theme, "Big cats: predators under threat," aimed to bring attention to big cats' declining populations. The Sumatran tiger, or Panthera tigris sumatrae, is listed by the International Union for Conservation of Nature as a critically endangered species, estimating that there are only about 400-500 of them remaining in their natural habitats of the forests of Sumatra. The organization states that the population is declining due to "habitat loss" from expanding oil palm plantations, "human-tiger conflict" and "illegal trade." "Sumatran tigers are the smallest surviving tiger subspecies and are distinguished by heavy black stripes on their orange coats. The last of Indonesia's tigers - as few as 400 today - are holding on for survival in the remaining patches of forests on the island of Sumatra. Accelerating deforestation and rampant poaching mean this noble creature could end up like its extinct Javan and Balinese relatives. "In Indonesia, anyone caught hunting tigers could face jail time and steep fines. But despite increased efforts in tiger conservation - including strengthening law enforcement and antipoaching capacity - a substantial market remains in Sumatra and the rest of Asia for tiger parts and products. Sumatran tigers are losing their habitat and prey fast, and poaching shows no sign of decline." Following an investigation into Sunday's slaying, officials said that the tiger was missing internal organs as well as its teeth, claws and some of its skin. Reuters reported the parts are sometimes sold as artifacts or used in traditional medicine. "We regret that they killed the tiger," Sianturi, with the Natural Resources Conservation Agency, told the news agency. "We will prove that its body parts are being traded." It's not clear whether those responsible for killing the tiger will face prosecution or what the penalties would be. In 2015, AFP reported that four men in a village in Indonesia's Aceh province were taken into custody after killing a Sumatran tiger and attempting to sell its body parts. They faced up to five years behind bars, according to the news agency.